1.) 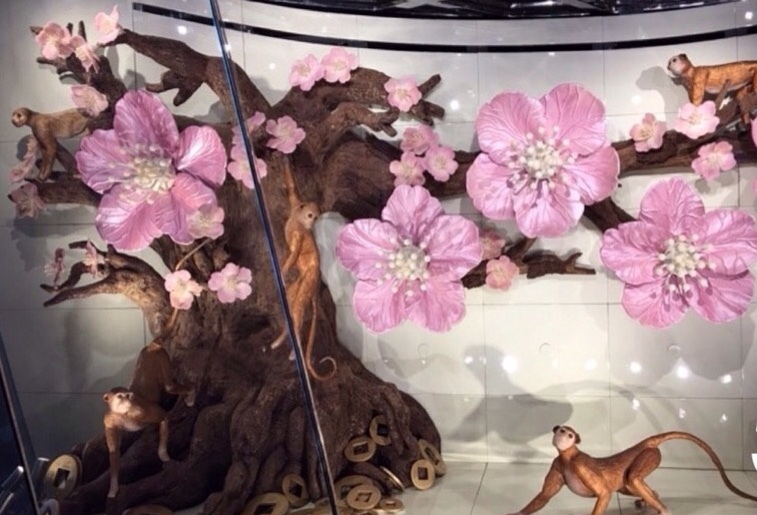 This display (see photo) was assembled by the Jean Philippe Patisserie in Las Vegas, Nevada. 200 pounds of dark chocolate were used for the tree alone. The monkeys were carved of fondant and milk chocolate. The flowers were made from white chocolate and candied sugar. The coins were made from gold dust and dark chocolate. The year of the monkey began on February 8, 2016 and ends January 27,2017. 7.) The next year of the monkey will be 2028. The previous one was 2004. The year of the rooster begins January 28, 2017.